This year’s Helsinki Design Week was a citizens’ fest more than ever. Organised for the 12th time, the design festival spread across the city from 1 to 11 September, reaching 158,000 visitors in total. This means an increase of 38,000 visitors compared to previous year. The festival included 256 events for design fans and professionals, organised by both Helsinki Design Week and 150 independent event organisers. Festival theme was ‘Better’, to explore how design can focus on developing services and connecting people instead of producing new objects. This theme was addressed through several discussions, specialist lectures, and exhibitions. This year, Helsinki Design Week evolved from one main exhibition to the streets of Helsinki with an impressive 11-part installation series. The installations made the event more visible than ever to the people and awoke interest throughout the world among the tourists and media representatives visiting Finland. HDW HOP city installations were explored by tens of thousands of people. The main installation – a bubble around The Three Smiths statue – achieved 34,000 visitors during seven days. 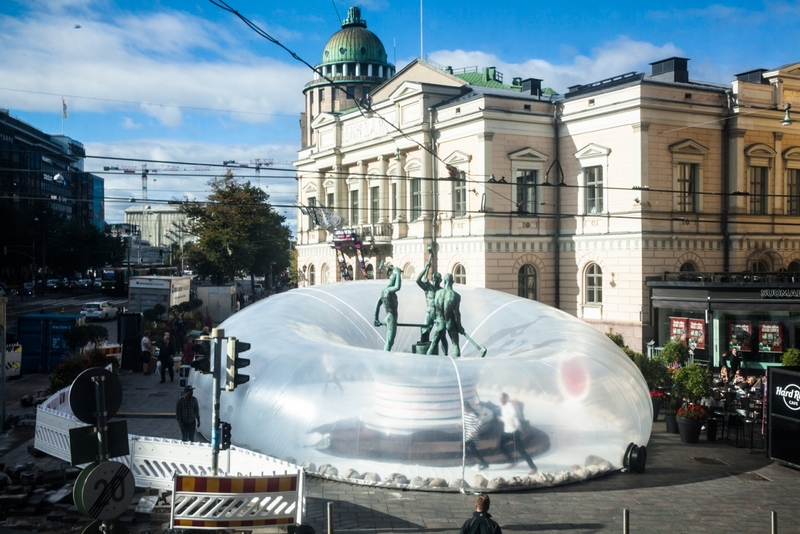 The bubble turned out to function as a temporary living room in the core of the city where strangers took to talking with each other and listen to jazz, se lighting art, and dance to the rhythms of the DJ. The programme also featured Finnish as well as international key notes about design, graphic design, and fashion. 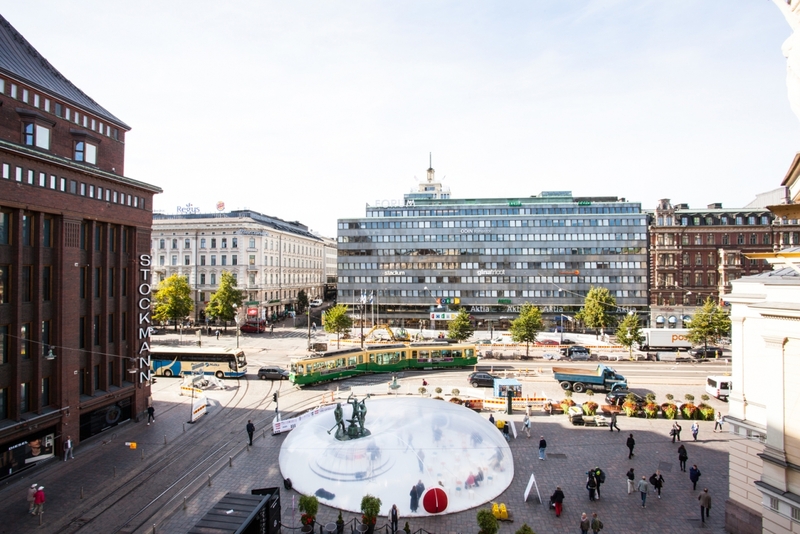 Other installations in the series on Keskuskatu, in the market square blocks, and on stage at Esplanade, for example, also attracted the citizens to experience design. Half of the ten main events were novelties that were eagerly accepted. Especially the Design Diplomacy series was a success, introducing two design professionals discussing in ambassadors’ residencies in the form of a fun new card game. Fully booked evenings allowed hundreds of people the opportunity to peek behind diplomats’ doors and discuss design’s meaning and future across borders. Participating embassies included Iceland, Sweden and Italy. The next phase is to export this concept to the world. Sauna Talks chaired by Aira Samulin and Rosa Meriläinen, for example, puffed steam on five interesting topics in Löyly, Allas, Arla and Hermanni. Ideas gathered from these discussions are documented into a pamphlet that will be published at Sauna Day organised by the City of Helsinki and Yhteismaa on 29 October. Habitare achieved 50,000 visitors, which means 10,000 new visitors compared to previous year. The Showroom event for design and lighting professionals took place in a handsome setting among the 100-year-old frescos of the National Theatre. Design Market and New Market gathered circa 25,000 design fans to the Cable Factory. In 2017, Helsinki Design Week is to celebrate Finland’s 100th anniversary. A significant role will be given to the new international design week network that consists of more than 50 design and urban festivals around the world, including Tokyo Design Week, London Design Festival, Design Week Mexico, NYCxDesign, and San Francisco Design Week. Helsinki is set to host the first major event for the network in September 2017. The event is to address independence and dependency from the point of view of design, product development, and economy. It also creates a tangible framework for designers to build a new national identity, to strengthen international networking, and to develop cooperation and innovation. This way it also supports the Finnish exports. Helsinki Design Week 2017 will take place from 7 to 17 September 2017. The first Summit event of the World Design Weeks network is held as part of Helsinki Design Week from 13 to 15 September 2017.